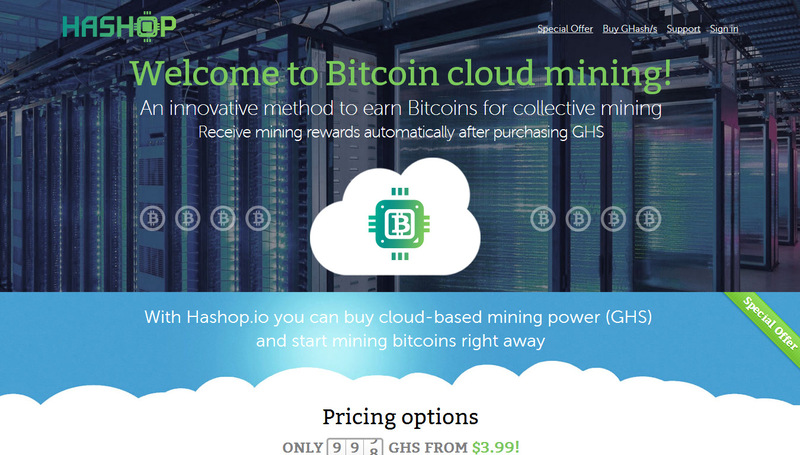 Hashop.io is a relatively new service offering Bitcoin cloud mining services that we have decided to check out. The service itself was announced about two months ago, but we decided to give it some time in order to see if it will be here to stay or not. The good news is that the service is still here and has been adjusting their prices down with the increase of the network difficulty. With that said we do still want to warn you to be careful should you decide to try this service yourself. The company behind the service is apparently registered in the Seychelles and the website itself does not give you too much information on who is actually behind the website. The business model that this service follows is very similar to that of Cloudhashing – targeting people that are new to crypto currencies. 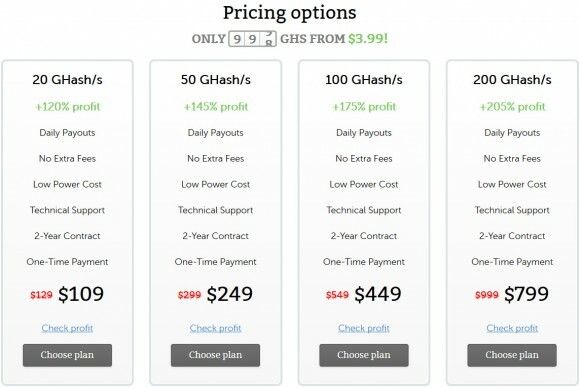 The Bitcoin cloud mining plans that Hashop.io currently offers are in the form of 2 year contracts and you have the following options: 20 GHS for $109 USD, 50 GHS for $249 USD, 100 GHS for $449 USD or 200 GHS for $799 USD. The supported payment methods are a Credit Card (Visa/MasterCard), Bitcoins or Wire Transfer. There is also an option for future cloud mining contracts that will start on 1st of June that come cheaper in terms of price, but the two more jumps expected by then in the Bitcoin difficulty will most likely make them not that more interesting anyway. With a price of about 0.013 BTC per GHS for the cheapest plan this certainly is not the best price you can currently get in the form of cloud mining hashrate an even at the most expensive plan the price per GHS is about 0.00945 BTC per GHS. But that is not the problem, the actual problem is that the Profit calculator offered by the service does produce some really nice numbers such as about $128 USD actual profit (after you return the $109 USD paid for the contract) after two years if you buy the 20 GHS plan. This may sound really nice, but running the numbers through an independent profit calculator produces significantly different numbers, ones that say you cannot even get half of the money you have invested back from the mined coins. That of course is with the current market conditions which are far from great, but when investing in cloud mining you should do the math for the best and for the worst case scenario before actually giving your money. When you register and get a contract pretty much all you get is a Balance tab with a brief information about your current hashrate and mined BTCs as well as an Account page where you can edit your details. There is no detailed statistics or option to change settings in the mining process or to use a pool of your choice. According to the information available you should be get an option to convert your purchased GHS to BTC (sell them back at lower price) in a week after you have purchased a cloud mining contract. This is a good option should you decide you no longer want to continue using the service and recover some of the money you have invested as most other long-term cloud mining services do not offer such an option (unless they have a exchange). Also do note that the service has a maintenance fee of $0.00045 USD per hour per GHS, this fee is subtracted from your mined coins depending on the amount of GHS you have and you may miss reading about this fee. Our conclusion in short – be careful with that cloud mining service, even though it has been available for a while and seems to be here to stay. Their prices, while lower than some other alternatives, are still pretty high and it is doubtful if you will manage to break even let alone make some profit with the current market situation. There are better priced alternatives available, ones that have been available for longer time and have earned the trusts of many users that you should stick with if you are interested in Bitcoin cloud mining.